← Is your MP on the list? He’s normally got an answer for everything when it comes to cleansing Great Britain of sick and disabled people. The recent, so called ’emergency’ budget was clear evidence that the loathsome Iain Duncan Smith has given up on helping nearly half a million people in the laughable ‘Work Related Activity Group’ back in to work. The whole purpose of Employment & Support Allowance was to ‘help people back in to work’ and now Duncan Smith has effectively abandoned the idea. Such is his failure to help anyone that he’s taken to punishing sick people who’ve been through hell and earth to get some support from his flagship ‘tailor made’ made Work Programme by taking away their status as ‘limited in their capability to work’. Instead, he’s taken to pretending that people with serious limitations are as fit as a fiddle and should receive no more money than just any old ‘actively able to seek work’ Jobseeker’s Allowance claimant. It’s Duncan Smith all over, he boasted and boasted of getting 2.5 million people off the sick and in to work, he even considered people dying in the run up to or shortly after one of his wretched work tests to be a price worth paying, he’s wilfully obstructed anyone who wants access to the figures highlighting this absolute tragedy, he’s been forced in to recognising the failure of his Work Programme. He knows all too well that far more people have got through his stricter than strict test than he, or the Daily Mail, ever thought possible. Even his so called ‘payment by results’ handouts to private work programme providers (of £13,000 per person) have back-fired on him as worse than useless results show that you just can’t get genuinely sick people back in to work. Calling the genuinely sick scroungers has done little to encourage employers in to taking them on in meaningful positions of employment. The astonishingly reckless right wing media continues to portray this awful man as some kind of welfare reform miracle, to read a copy of the Daily Mail, you’d be led in to believing Duncan Smith actually knows what he’s doing. 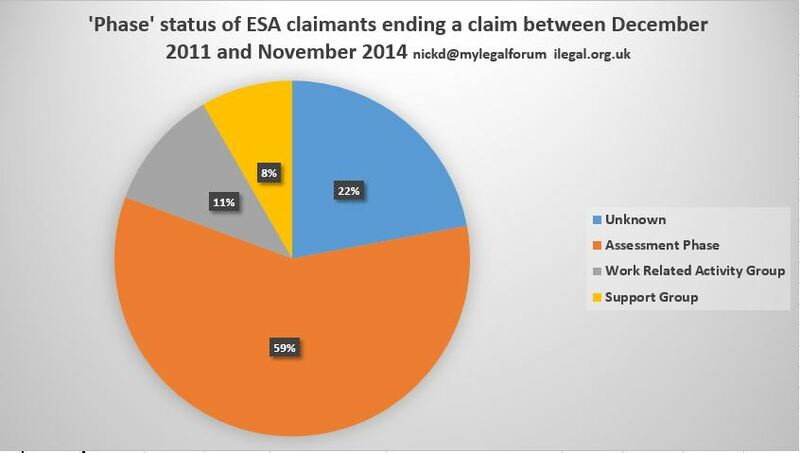 In reality, anyone who knows the truth behind these tragic DWP figures would know IDS is actually on another planet. Shamefully, it appears he’s far from on his own. The latest DWP figures counting the number of claimants coming off Employment & Support Allowance show us something truly unbelievable….. Yes, that’s right 404,840 Employment & Support Allowance claimants, who when ending their claim, the DWP does not appear to have the first clue as to which ‘phase’ of Employment & Support Allowance they were in. 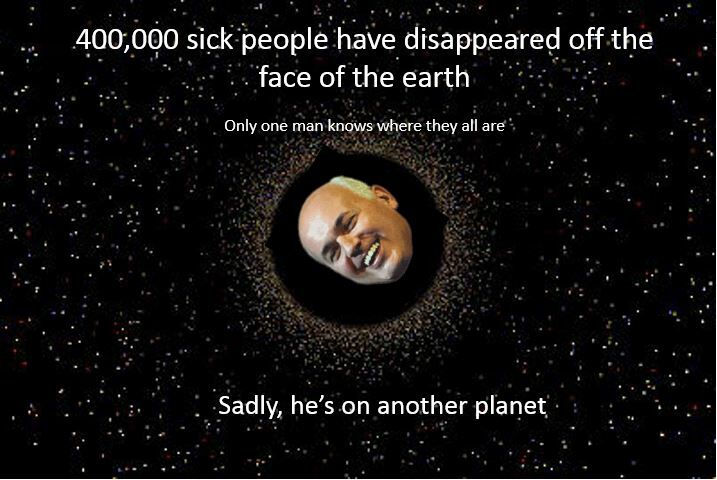 It’s an astonishing 22% of all claimants coming off the sick, seemingly they’ve joined IDS in outer orbit…. 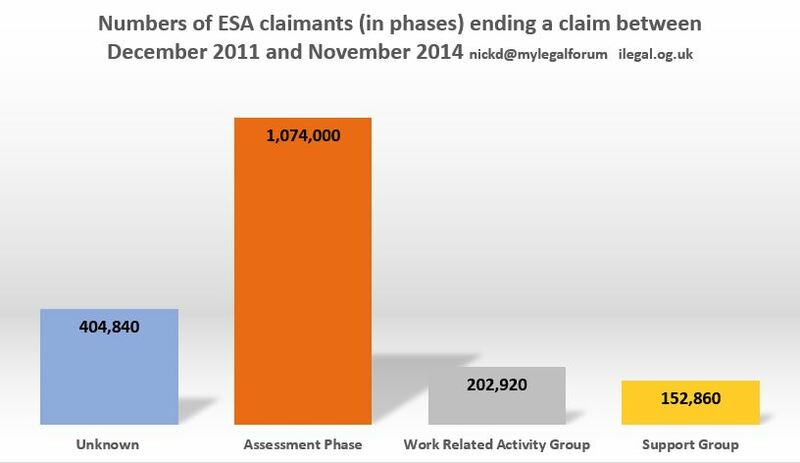 And now in actual claimant numbers….. It is indicative of the level of chaos within the DWP and deeply concerning that over 400,000, enough people to populate an entire city, are seemingly leaving a benefit with no data as to what ‘phase’ of Employment & Support Allowance they are in. The ‘unknown’ figures may have washed when records were not being kept but once the collation of data started, there is absolutely no reason for such huge numbers to come off benefit with such incomplete data as to status. Anyone dealing with the DWP will know how hopeless they can be when it comes to tracking claims. Many claims end up becoming ‘clerical’ with the details being recorded manually rather than properly on a computer, endless numbers end up moving from one phase to another with a lack of data exchange between the DWP and their contracted assessors, some have the phases designation changed at appeal, but whatever the reason – the DWP has no excuse for being unable to specify where the claimant sits within the adjudication framework when ending their claim. It’s yet another serious flaw in this errant set of statistics. This entry was posted in DWP and tagged black hole, Daily Mail, dwp, ESA, Iain Duncan Smith, Soundgarden, statistics, work programme, WRAG. Bookmark the permalink.